Now, contrary to what Google maps told me, it is NOT before the Mercedes dealership but rather after. 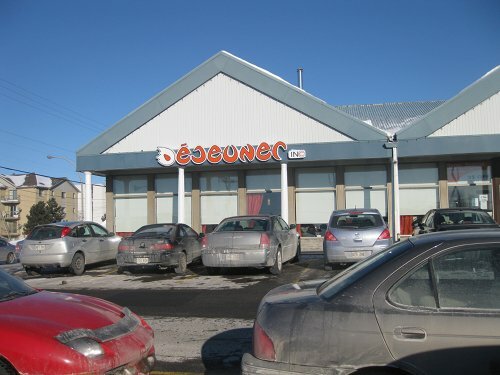 You will notice it since it is in a strip mall with ample parking. The lot can get quite full as plenty tend to fill this place up. The West Island is in need of some more brunch places in general not just because I hate hunting for parking but because lots of west Island people like to do brunch and there are more people than there are brunch spot seating capacity. When you walk into this wheelchair accessible establishment (brownie points for this) you notice two levels; one on the lower section, which is very well lit, and one a little bit higher up and near the back. I like the back section since it is nice and cozy. 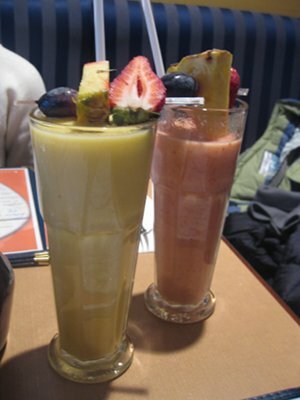 We started off with some smoothies; there was the Tropik ($5.25) and the Oramango ($5.25). The Oromango was orange, mango, yogourt and honey while the Tropik was mango strawberry, pineapple, yogourt and honey. Both of these drinks were very tasty and were nice and thick, which makes them well worth the $5. There was also coffee which was included and had free refills – which is always preferable. My friend had the eggs Benedict with asparagus with Swiss cheese ($12.15) which came with fresh fruit and home cut potatoes. The eggs Benedict was served in a deep rectangular bowl and drowned with hollondaise sauce. The asparagus was a nice touch and the taste was pronounced although, it was a little bit difficult to chew – almost tough. I know I’m being picky but I did notice it and that’s one thing about asparagus that bothers me. 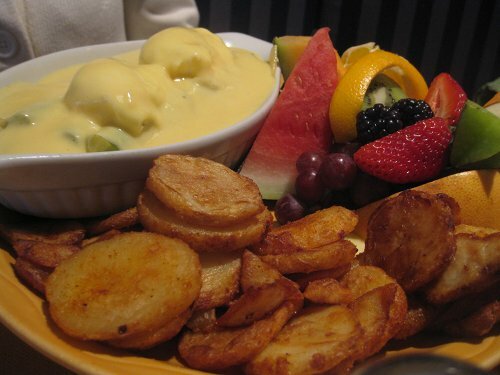 The potatoes were decent, and the fruit was good. I did like the fact that they had both on the side and free coffee so it makes it a good deal for the price you pay especially since asparagus eggs Benedict can go for a little bit more. I did also have an issue with the consistency of the hollondaise sauce as I felt it was a touch liquidy and the eggs Benedict was literally drowned in it. From an aesthetic point of view, it’s not much to look at and from a taste point of view, it was ok – it did not ruin the dish so I was happy with that. 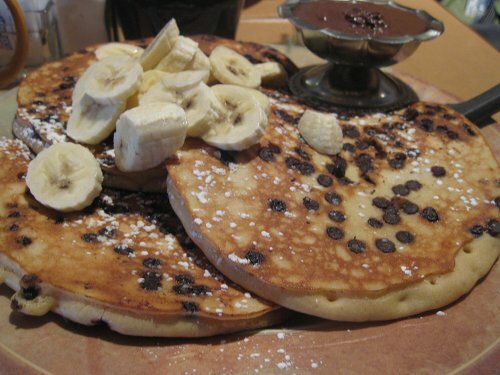 Next came my dish which was the Chocolate pancake ($12.15) and it had 3 chocolate chips infused pancakes topped with bananas and a side bowl of melted chocolate you could drizzle on it. The kid in me was loving this dish, and the adult in me was loving how filling it was. In fact, in a rare occurrence I was unable to finish it because it was so filling. The melted chocolate was a nice touch and I made sure to dip my bananas in it, but word to the wise, move quickly because it will harden if you take too long. The pancakes were nice and thick making for a filling meal experience. I should note though that $12.00 for pancakes is a touch much and granted you do get full, normally the prices should be a little bit less especially since this is in the suburbs where prices should be less than downtown. The service started off good and the refills were fast at the beginning. Our meal came quickly but by the middle of our stay, I had a hard time getting a coffee refill and when our waiter came I felt rushed. With a menu this big you will get some good vegetarian options as well with 12 items in the fruit section you get some choice for healthy items as well as some possible vegan options in the fruit realm. The plates were large, the meals were filling, the décor was comfortable and the menu options were plentiful and varied. On the negative side, some dishes cost more than they should and the eggs Benedict was drowned in hollondaise sauce which literally hid it. It’s a decent spot if you live in the West Island and you want a classic breakfast spot that isn’t a huge chain. This is the Restaurant we went to for my Mothers Day Breakfast! OH MY GOSH… What a great meal we had! If you are ever in this area around breakfast do stop in and grab a plate, you WILL NOT regret it that’s for sure….. The staff goes out of their way to treat you with kindness and respect. I gave a 25% tip as a thank you for such a wonderful dining experience… The plates were so unbelievably huge, my son was able to finish his plate and part of his sister’s pancakes. My husband finished off his plate and my potatoes and the other egg… my MOUNTAIN of fruit was just that and it was all I could do to finish that off. I LOVE fruit. NO REGRETS!! Thank you for such a great Mother’s day!! The food was excellent. The menu is multi-page with lots of offerings. The coffee was very good, but refills you have to wait for. The service was weak, maybe just the waitress we had? However, we will return. There was a line to get in, which did move quickly. Next time we will arrive earlier.